At ICRAVE, we’re big on specifying products and materials that are innovative not just aesthetically but also in how they affect our health. Our work in hospital design and wellness-centered spaces involved being very careful about how our design specifications would affect those that are extra vulnerable to toxicity and trace chemicals. It’s important to know what the products and materials we specify are made out of so that we avoid doing any harm to the environment and to people’s health. Luckily, lots of manufacturers are taking steps towards transparency and new products are coming to market that completely rethink what used to be highly pollutive. Wellness design is about more than just eliminating lead paint and asbestos. Obviously materials should be toxin-free but they can also improve your health. Studies have shown how interior environments that follow wellness standards see reductions in absenteeism and increases in productivity. That can mean using a product that improves air quality, rethinking a traditionally toxic material, or choosing a material palette that is known to benefit mental health. It’s also not just about materials – layout is important as well. Stairs can be located more prominently than an elevator in order to encourage a more active lifestyle. Light fixtures can be used to mimic the color temperature of the sun and benefit our sleep cycles especially in 24-hour work environments. Plants, green walls, and water features can be placed in noticeable locations. Whereas Japanese doctors have been prescribing forest bathing for decades now, the research is catching up to prove how exposure to nature and sunlight can have positive affects on health. Our own work in hospitals involved incorporating our hospitality experience into a typically sterile environment. Not only were we specific about the products and materials being PVC-free and non-toxic, our approach involved making the patient experience centered around feeling cared-for and not just another name on a list. 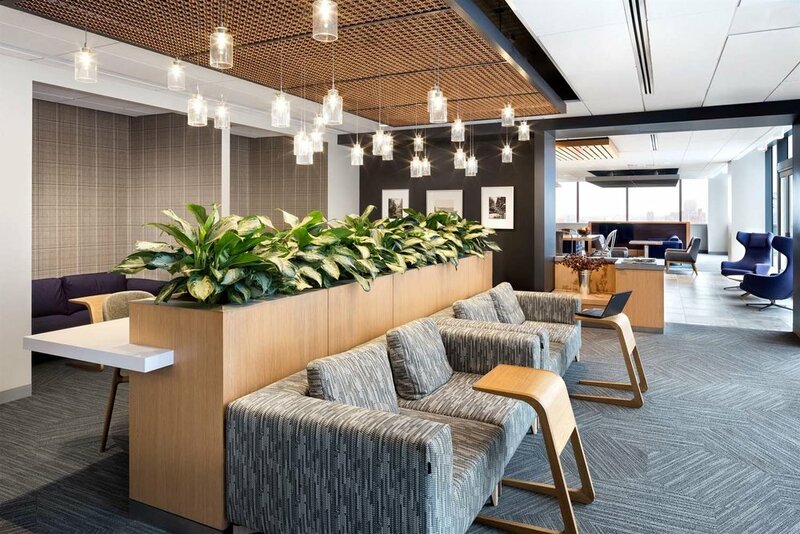 This consisted of bringing color and joy into the waiting areas, providing moments of privacy and activity into the space, and broadening our understanding of ergonomic furniture to encompass the entire spectrum of people’s health and ability that utilize that space. Naava is more than just a green wall. Inspired by the Nordic forest, these products bring the forest inside along with all the accompanying health benefits. It filters and humidifies the air and even has sensors to track its influence on the interior air quality. 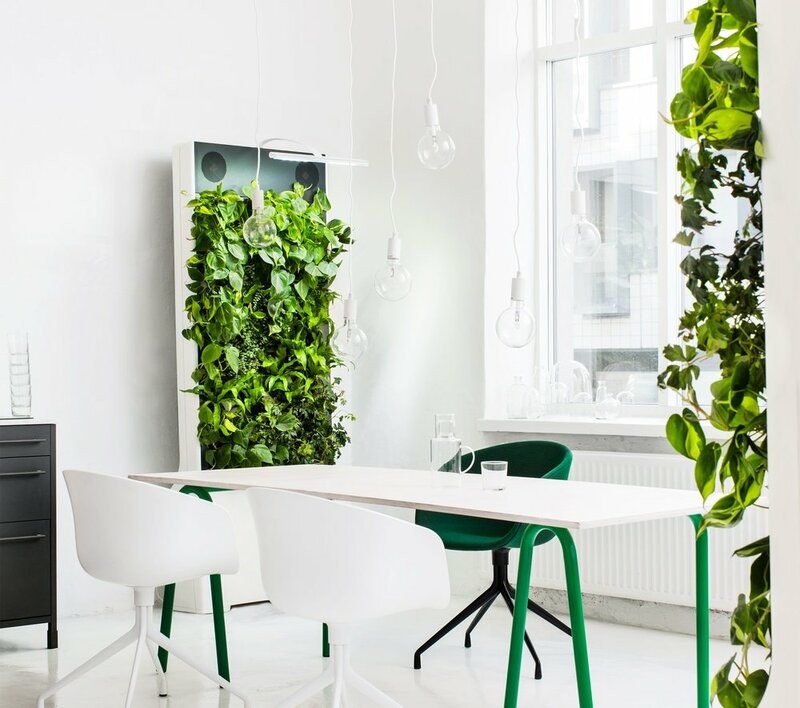 This green wall doesn’t just beautify the space, it also purifies it. In 2014, The Living famously collaborated with Evocative to build a “mushroom tower” at MOMA PS1 but this company does much more than art installations. Their product is a non-toxic, sustainable material that is grown in a lab from a combination of agricultural waste and mycelium. It serves all the same functions as Styrofoam and other synthetic foam-like materials but is VOC free and compostable. They have mycelium-based packaging, acoustical tile, particle board, paneling systems, and can even be grown dense enough to serve light structural applications. It’s not always the case that a product that serves wellness purposes is also well-designed. This carpet tile is a glowing exception. It is the first floorcovering to achieve Living Product Challenge Petal Certification, and its biophilic approach translates into its absence of toxic chemicals, its environmentally conscious fabrication, and its nature-inspired aesthetic. I always find myself in an ethical quandary when I’m specifying leather fabrics. On the one hand, real leather has a bad reputation of animal cruelty and pollution, while on the other hand, synthetic leather can be made from all sorts of petroleum-based polymers and toxic processes. Bolt Threads is the perfect medium. They are a high-performance material science lab and fabric company that takes a biophilic approach to its products. They currently have a synthetic silk made from yeast fiber and a synthetic leather made from mushrooms, both of which are sustainable and non-toxic. Plus they’re a favorite product of Stella McCartney.